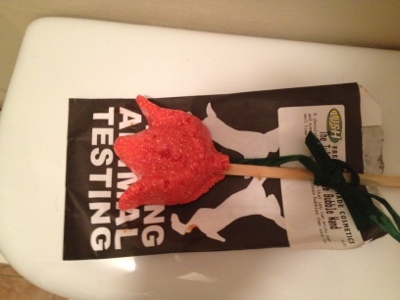 So in my last post I mentioned the Lush Tulip Re-usable Bubble Bar. I'll be quite honest I didn't have particularly high expectations for this bubble bar, as I couldn't believe it was really going to be reusable. I've used lots of Lush bubble bars, and they crumble away really quickly once they hit the water, so I couldn't see how this was going to work. Anyway, this one is on a lollipop stick and the idea is that you swirl it around in the bath whilst the water is running. I swirled it around quite a few times. This is the amount of bubbles it produced. It didn't produce loads and loads of bubbles but then the bubble bars never really do anyway, so I wasn't overly disappointed with this aspect. 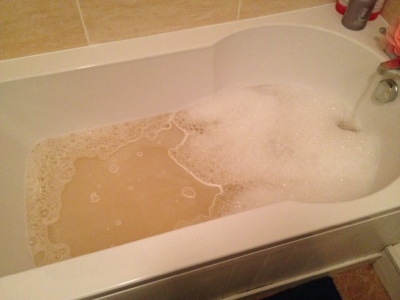 It turned the bath sightly orangey and it smelled lovely. Like a chocolatey orangey smell. As you can see, there was still loads left - at least another 2 or 3 baths I would say. I'll update this post once I've finished it off and let you know how many times I did use it. The one word of caution I would say with this, is to make sure you take off the green ribbon before putting it anywhere hear the bath. Once it got wet all the dye transferred to my fingers and then wouldn't come off! So just remove it first. Have you tried the re-usable bubble bar? Would you be more inclined to after reading this review? Let me know your thoughts. I LOVE the new blog design? Who made your social media buttons?